Copyright © 2013 Minho Kim et al. This is an open access article distributed under the Creative Commons Attribution License, which permits unrestricted use, distribution, and reproduction in any medium, provided the original work is properly cited. Particulate matter less than 2.5 μm in aerodynamic diameter (PM2.5) is a category of air pollutant that consists of solid particles and liquid droplets in organic and inorganic substances. The major components of PM2.5 are sulfate, nitrates, ammonia, sodium chloride, carbon, mineral dust, and water . According to the US Environmental Protection Agency (EPA) , the major components of PM2.5 in the eastern United States are sulfate, organic carbon, and ammonia; in the western United States, organic carbon, nitrate, elemental carbon, and sulfate constitute approximately 70 % of PM2.5. PM2.5 can be emitted as the result of natural processes such as forest fires as well as from anthropogenic sources such as power plants, factories, and vehicles. PM2.5 is small enough to be inhaled through the throat and nose, and exposure to PM2.5 has been associated with increased risk for respiratory and cardiovascular diseases and death [3-6]. Because of these adverse health effects, federal, state, and local government agencies across the continental United States have established a ground-level PM2.5 monitoring network with approximately 1500 sampling sites. However, because the distance between many monitoring sites makes it difficult to construct a continuous map of PM2.5 concentrations for the entire country [7,8], aerosol optical depth (AOD) measurements by remote sensing satellites have been used to supplement PM2.5 data [9,10]. In recent years, AOD data from Moderate Resolution Imaging Spectroradiometer (MODIS) sensors aboard two satellites (Terra and Aqua) operated by the US National Aeronautics and Space Administration (NASA) have been used to estimate the relationship between AOD and PM2.5 concentrations . Although researchers have explored the relationship between ground-measured PM2.5 concentrations and MODIS AOD data, few have compared estimates of this relationship based on combined data from both satellites with estimates based on data from each satellite alone. In this study, we report the spatial coverage and AOD-PM2.5 association of two different approaches in conjunction with ground-based monitoring stations, which may provide insights for national research into the effects of fine particulate matter on human health. We analyzed daily MODIS AOD data collected by the Terra and Aqua satellites during 2005 because that was the year with the highest average data coverage per day (27%). The Level 2 MODIS science data include many parameters associated with location and time, solar and viewing geometry, science, cloud mask and quality assurance . Optical Depth Land and Ocean (ODLO) is a science parameter that includes AOD values at 0.55 μm for both ocean and land. We downloaded Terra and Aqua daily ODLO measurements for 2005 (Collection 5.1) from NASA’s Level 1 and Atmospheric Archive and Distribution System (LAADS) as Level-2 AOD data sets . The MOD04 is the first data set to monitor global AOD over land . The Level-2 AOD data are derived from Level-1 products at a 10 × 10 km2 nominal spatial resolution. The AOD values of the ODLO parameter are stored as 2-byte integers, which require a conversion procedure to obtain real physical AOD values using the equation with a scale factor (a) and offset value (b). Physical AOD values of ODLO parameter = a × (integer value – b) where a is equal to 0.001 and b is equal to 0 (personal communication with Bill Ridgway in NASA, August 19, 2009). AOD values generally range from 0 to 5, with values greater than 1 being associated with heavy haze [7,13]. We obtained hourly ground-level PM2.5 concentrations across the contiguous US states from EPA’s Air Quality System (AQS), which collects ambient air quality data from state, local, and tribal agencies . All AQS PM2.5 data are collected in accordance with EPA-approved reference and equivalent sampling methods, and all monitors in the contiguous US are included in the AQS. We also obtained monitor site information from the AQS, including the category of land use near the sites (agricultural, commercial, industrial, residential, or other), the population density category of site areas (rural, suburban, or urban), and the latitude and longitude of the sites. We adopted an exact pixel-to-point match procedure to extract AOD values. All the points, representing each ground-level station, were overlaid on the MODIS ODLO parameter imagery to derive an AOD value for each pixel where a monitoring station is located by its latitude and longitude. The linked data set with both daily AOD and hourly PM2.5 has 66,768 records (36,587 for Terra and 30,181 for Aqua). The monthlyand seasonal-average AOD values of individual ground stations were derived from the daily AOD data set. Hourly PM2.5~ Land Use + Site Setting + Season + AOD + Site (random effect). Land use categories were agriculture, commercial, industrial, residential (reference) and “other”; site setting (i.e., population density) categories were rural, suburban, and urban (reference); season categories were spring, summer, fall, and winter (reference). All models also adjusted for site-level random effects of unobserved or unmeasured factors associated with PM2.5 measurements. We used regression coefficients associated with AOD to evaluate the direction and magnitude of the association between AOD and PM2.5 and considered p-values <0.05 to be indicative of a statistically significant association between AOD and PM2.5 concentrations. All the models were implemented in SAS 9.3 using Proc MIXED. We found that the mean number of days with valid AOD data was higher with use of the combined Terra and Aqua datasets (117) than with use of either the Terra dataset (91) or the Aqua dataset (78) alone (Figure 1). Terra and Aqua provided similar AOD coverage in the western and central regions of country; however, Terra provided better coverage in the eastern region. We also found that the use of data from both satellites generally resulted in more valid observations than the use of data from either satellite alone (Figure 2), although the overall increase in spatial coverage with both satellites was primarily attributable to greater coverage during winter. During the other three seasons, the use of data from both satellites resulted in coverage little different from that with each satellite alone (Figure 2(b)). Figure 1. Map showing percentage of days in which valid AOD data were collected at PM2.5 monitoring sites by (a) Terra only, (b) Aqua only, and (c) Terra and Aqua. Figure 2. 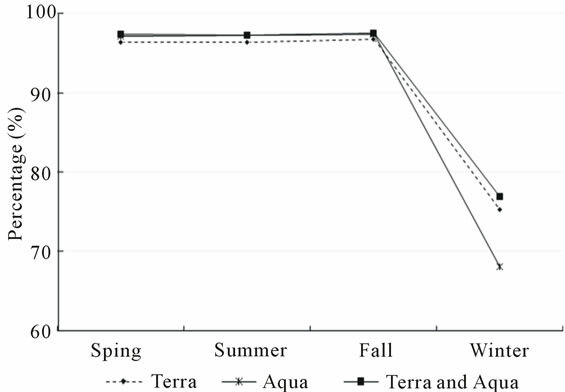 Percentages of valid AODs for Terra only, Aqua only, and Terra and Aqua: (a) monthly AODs and (b) seasonal AODs. ficient observations with valid monthly-average AODs across all ground monitoring stations, as depicted in Figures 3(c) and (d). Overall, we found that AOD measurements were significantly associated with PM2.5, concentrations in all states except Colorado, although the strength of this association varied substantially by state, and the association was generally stronger in eastern states than in western states (Table 1 and Figure 4). 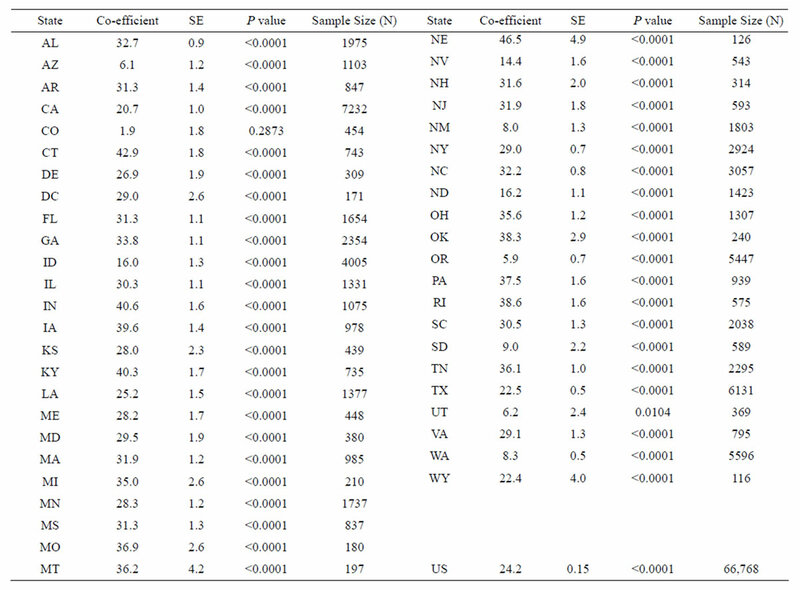 State-level regression coefficients for AOD ranged from 1.93 in Colorado to 46.0 in Nebraska. Figure 3. 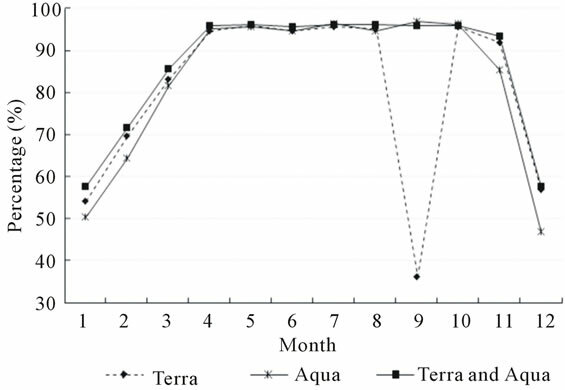 Spatial distribution of differences in days and months with valid AODs at each station: (a) difference in number of days between combined Terra with Aqua and Terra alone, (b) difference in number of days between combined Terra with Aqua and only Aqua alone, (c) difference in number of months between combined Terra with Aqua and Terra alone, and (d) difference in number of months between combined Terra with Aqua and only Aqua alone. Figure 4. 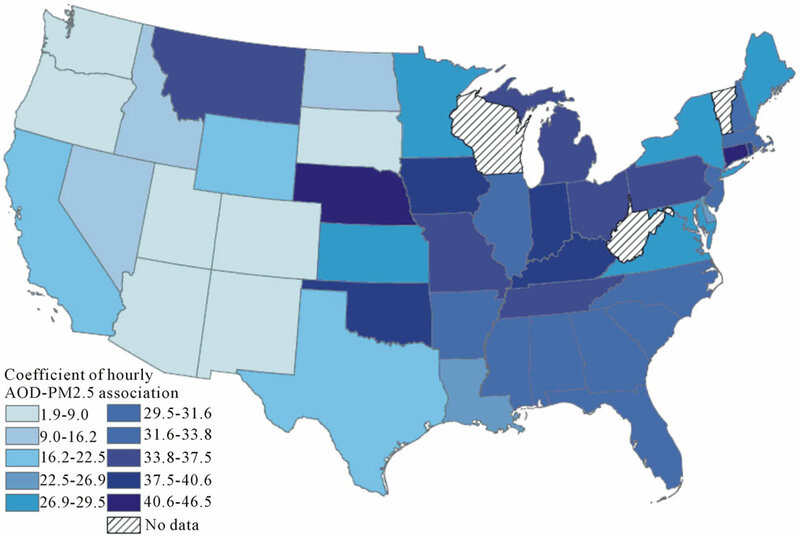 Coefficients of hourly AOD-PM2.5 association by state. Table 1. State-specific regression coefficients associated with satellite measurements of AOD. fects in these three states was largely because of a lack of data for the winter and spring: Montana had only 6 records for the spring and winter, Nebraska had only 4, and Wyoming had only 2. Our results showed that the combined use of Terra and Aqua AOD data resulted in more days with valid AOD data than the use of AOD data from either satellite alone. Paciorek and Liu (2009) had argued that a lack of AOD data would be a major problem if AOD data from satellites were used as a proxy for PM2.5 concentrations . Our results indicated that this problem could at least be reduced with the use of data from multiple satellites. We also found that the linear mixed model fully controlled for site-specific effects and seasonal influences on the relationship between AOD measurements and PM2.5 concentrations. Our findings confirmed a significant linear association between AOD measurements and PM2.5 concentrations, although the magnitude of this association was substantially weaker in the western region of the country than that in the eastern region. The relatively weak association in the west may be attributable to less accurate AOD measurements caused by high surface reflectance from rocky and desert areas . Despite these inaccuracies, we anticipate that MODIS AOD data can be used as a surrogate for ground-level PM2.5 concentrations in research requiring estimates of PM2.5 exposure and that AOD data will be especially useful in studies of chronic disease outcomes during summer and fall and in geographic areas where the correlation between MODIS AOD data and PM2.5 concentrations is particularly high [3-6]. Because of this potential usefulness of AOD data in public health studies, attempts should be made to provide more comprehensive AOD coverage. Until such comprehensive coverage is available, the use of models, such as the Land Use Regression and Community Multiscale Air Quality model, in conjunction with AOD data, may be one way to overcome a lack of AOD coverage and ensure adequate spatial continuity of AOD estimates for use in public health research [16,17]. In a follow-up study, we plan to explore the relationship between ground-measured PM2.5 concentrations and AOD values at US County or ZIP Code levels because many nationwide health surveys have used these levels as geographic units of analysis. The authors thank Bill Ridgway of NASA for his assistance in helping us acquire true AOD values from MODIS Level 2 imagery. Dr. Minho Kim conducted this research while employed at the Centers for Disease Control and Prevention. This work was partially supported by NASA Applied Sciences Program (Grant No. NNX09AT52G). EPA (Environmental Protection Agency) (2010) Technology Transfer Network (TTN) Air Quality System (AQS) 2010. http://www.epa.gov/ttn/airs/airsaqs/detaildata/downloadaqsdata.htm. *Disclaimer: The findings and conclusions in this report are those of the authors and do not necessarily represent the official position of the Centers for Disease Control and Prevention.